About a third of U.S. college presidents believe sexual assault is a problem on American college campuses, but only 6 percent believe it’s a problem on their own campuses. That’s according to Inside Higher Ed’s fifth annual Survey of College and University Presidents, which was released Friday. The survey covered a range of topics, including the Obama administration’s college ratings proposal and the sustainability of college financial models, but the most significant (and alarming) finding was about the presidents’ thoughts on the prevalence of sexual assault on campus. 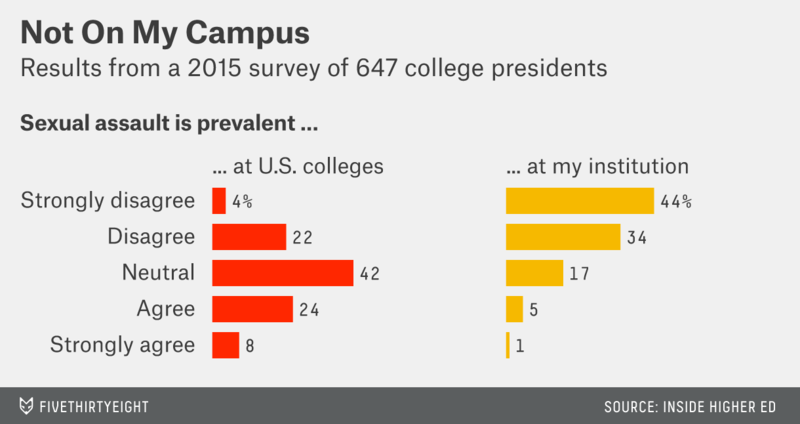 College presidents appear to be out of touch. The U.S. Department of Education in May released a list of 55 institutions with open investigations into Title IX sexual violence violations. Since then, that list has been periodically updated; as of January, it named 94 schools, including large public institutions such as Arizona State University and small liberal arts colleges like Sarah Lawrence. Some lawmakers have made campus sexual assault a priority, most notably with California’s recently passed affirmative consent standard and with the pending federal Campus Accountability and Safety Act. As my colleague Carl Bialik has pointed out, the data on sexual assault in college is hard to interpret, largely because of issues with the question of consent and because so many cases go unreported. One Justice Department-funded survey found that only 12 percent of college students who were the victims of sexual assault reported it — 4 percentage points lower than the general population — and that number was cut in half when the incident involved alcohol. Students and advocates across the country have demanded that administrations take more responsibility for the handling of sexual assault on campus. But very few of the college presidents surveyed (4 percent) were willing to say their school was doing an inadequate job of protecting women from sexual assault. Seventy-seven percent told Inside Higher Ed that their schools are doing a good job, and 19 percent were neutral on the question. That doesn’t bode well for addressing students’ concerns.